The Artist of the Month in May 07 in Gallery KekeTop is Alpheus Mvula. He currently lives and works in Windhoek Namibia. 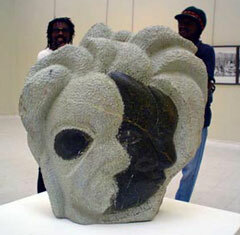 1994-1999	John Muafangejo Art Centre. Chairman for VAN-Visual Art in Namibia, president of art in the house found of Onakazizi Community project and Oniipa Art Centre. Mural painting for Legal Assistance Centre Domestic violence against women and children abuse. Ongwediva College of Education, visual art teacher’s workshop coordinator and Facilitator. Ongwediva College of Education, workshop for basket weavers and potters, coordinator and theory facilitator. NIED, Namibia institution of education, visual art facilitor.